Bleary eyes are creaking open all around New England this morning, but there is much joy to accompany the lack of sleep. The Red Sox won a thrilling game 4 of the ALDS with a walk off single in the 9th inning. All the more thrilling was the fact that Jason Bay scored the winning run off of Rookie Jed Lowrie's single. 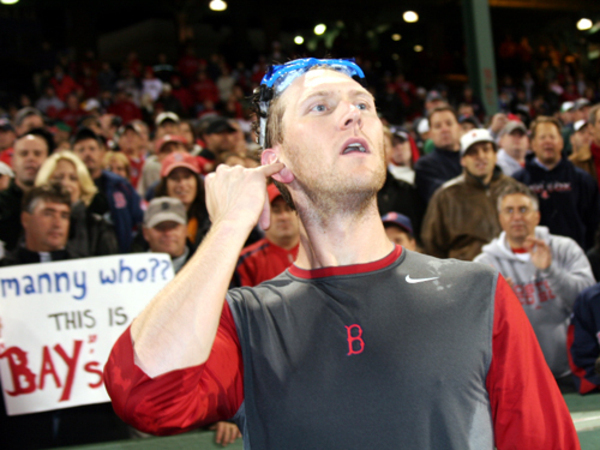 Jason Bay who arrived at Fenway as part of the deal that sent Manny packing to the Dodgers. I'll take Jason Bay's .286 batting average and 31 home runs any day, because he shows up every day to play. He's a member of a team, a part of Red Sox nation, not President of the Republic of Ramirez, that alternate universe that Manny lives in. Thanks Jason for writing a happy ending to one of the final chapters of The Saga of Manny (final, final chapter to be written should the Sox face the Dodgers in the World Series--a worst case scenario as far as I'm concerned because Manny would end up with a bit of pie no matter who wins, his Red Sox teammates having voted him a half share should they win). Good win, Jason. Now, let's go hunting some Rays. Whoot. It's Opening Day (the fourth for the Sox if you count Tokyo); it's time to hand out those rings and mostly it's time for a win. It's not right that we're playing Detroit for two reasons: 1) It should be the Yankees watching while those rings are handed out and; 2) Detroit is 0-6 and they've gotta win sometime. Let's hope it's not today. Yes, there's 4-8 inches of snow heading our way, but it's truck day, Boston's own sign of green grass, warm summer days, and the crack of a bat. Hat tip to Lisa on this one. The Red Sox are bringing the World Series Trophy to Portland tomorrow. You can see it at Hadlock Field from 11 to 4 and the trophy will also head to the Barbara Bush Medical Center. None of the seven former Sea Dogs who played on the Championship team will be visiting with the trophy--back in 2004, four Red Sox players took the trophy on a tour through Presque Isle, Bangor, Augusta, Lewiston and a certain bar in Portland. 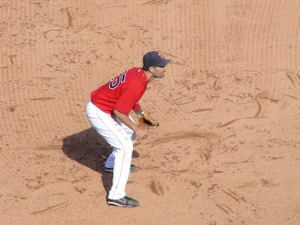 The Boston Red Sox and Mike Lowell have agreed to a deal that will keep the Series MVP in Boston for at least three years. Sighs of relief and joy all around Red Sox nation tonight because we all know Mike is better than the Cooler. Sports Illustrated--as always, the best pictures in sports. 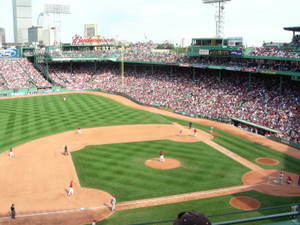 What Is Red Sox Nation? Gah. Desperate times call for extreme measures. Bottom of the 8th. Paps is now in, Oki having just given up a shot that makes the score 4-3. We need 5 outs from The Lord of the Dance and I think he can do it. It's one and two to Steven Spielberg (how he got into the line-up is anyone's guess), with Paps throwing 96 MPH heat. Update: Papelbon gets the first out with an easy grounder to Lugo. Update: Guy Hawkes is now up. He hit a home run last inning and a triple last night against Jonathan. Big swing and a miss on the high hard one. OOF. Missed on the outside of the plate. Rockies fans are praying in the stands and their pleas result in a foul ball. Lots of clasped hands and long faces. Coco snags a well hit fly. Inning over. We go to the 9th. Boston has a 4-3 lead. Update: Lowell leads off, top of the 9th. MIKE LOWELL for President. Or at least as Red Sox MVP for this season. He flies a tailer off to left for the first out. Update: What Will JD Do? No matter what he does, he won't enjoy it.....it's 2-0. He grounds out for the second out. His face looks exactly like it did when he hit the grand slam in the ALCS. Update: Tek up. Two strikes on El Capitan. Corpuscle begins the stroll to the dugout,only to discover that was just a bit outside. Slow roller, past the pitcher, but rounded up by Kaz for the third out. Update: Ok. Bottom of the 9th. Paps on the mound with a one run lead. Three outs stand between the Sox and their second WORLD CHAMPIONSHIP in this decade. We all know (thanks to the Yankees) that it ain't over til the fat lady sings. She's warmin' up, but she's not singing...yet. Two strikes to the catcher, and I swear, every time they show Rockies' fans in the stands, they are praying. Not cheering, not rooting, but Praying. One out. Update: two strikes on Carroll....please don't let him be Bucky 'effin' Dent (it's ok, I said that out of the side of my mouth). C'mon paps get this mutt. Fly ball. Great catch by Tacoby. WAY WAY back in left. UPDATE: Seth Smith is the last chance for the Rockies. Strike one. Can Francona possibly go 8-0 in World Series appearances? Sure he can, but it's now 1-1, as Paps misses in the dirt. Good stop by Tek. Ball two gets by him, but with no harm. 2-1. Rockies fans have stopped praying and are on their feet cheering now. Strike two fouled down the first base line. One strike to go. BRING THE HEAT, PAPS. HE does and it's OVAH. 12:06 EST Time. October 28th 2007. RED SOX ARE WORLD SERIES CHAMPS AGAIN!!!!!!!! I know we're not at Fenway, but what the heck? Middle of the 8th, in the 4th game of the Series with a 4-1 lead? We still need a bit of help, so I call on the greatest Rock n' Roll band evah. UPDATE: 11:34 Oh crap. They need more than mojo now.